In Europe, Christian Tremblay has been heard in recitals in Fontainebleau, and was invited to be concertmaster of the Orchestre de Chambre du Conservatoire Americain, under the baton of Philippe Entremont, for two consecutive summers. He was also awarded a special prize for the best performance of a contemporary work during that festival. As a recitalist, Christian Tremblay was also heard in the Netherlands for the Holland Music sessions, and in Singapore at the National University of Singapore for one of the opening concerts of the Yong Siew Toh Conservatory of Music. An enthusiastic orchestra player as well, Christian Tremblay has performed with various ensembles in Canada and the United States, including the Orchestra Symphonique de Québec, the Baltimore Chamber Orchestra, the Baltimore Symphony Orchestra, and the Annapolis Symphony where he is Principal Second Violin. Christian Tremblay received a Diplôme D’Études Supérieures en Musique II from the Conservatoire de Music de Québec and was awarded the Prix du Conservatoire upon graduating. He also earned a Graduate Performance Diploma and a Doctor of Musical Arts degree from the Peabody Conservatory. While a student at Peabody, Christian Tremblay was awarded the prestigious Presser Award. Christian Tremblay’s main teachers and influences have included Liliane Garnier-LeSage, Martin Beaver, Ellen Mack, and Gérard Poulet. Christian Tremblay is currently a full time faculty member at the Peabody Institute, teaching violin and group classes for the Peabody Preparatory, and a graduate musicology course and violin minor lessons for the Conservatory. In the spring of 2007, he was awarded the Excellence in Teaching Award by the Peabody Preparatory. 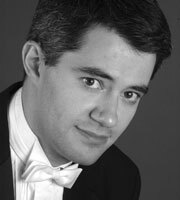 Christian Tremblay joined UMBC as part time Violin faculty in the fall of 2007.